Regla Torres Herrera, known professionally as Regla Torres, is a superb middle blocker and hitter. She has devoted her life to volleyball, playing no other sport. 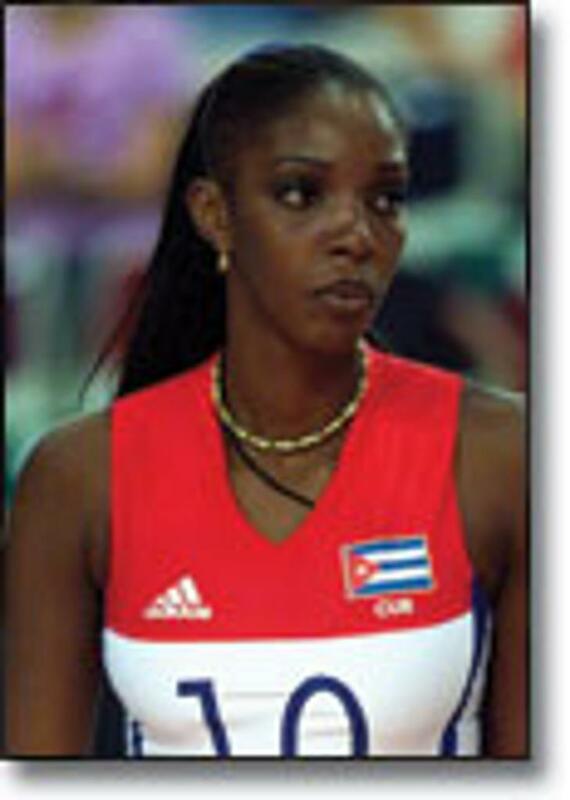 She started playing volleyball as a child, training from the age of 8 in a Havana sports school. By the time she was 14, she was participating in international matches with the Cuban Youth National Team, She participated in the Goodwill Games and the World Championships in 1990. She was initially chosen for the Cuban National Team at the age of 16 to participate in the Pan-American Games and the World Cup, where she won a gold medals in 1991. She also was a member of the team that played in the NORCECA Championships in 1991. Playing with the Cuban National Team, Torres became the youngest Olympic gold-medal winner in volleyball history in 1992 at the age of 17 at the Barcelona Olympic Games. She played simultaneously with the Cuban Junior National Team, winning a gold medal at the Junior World Championship in 1993 and was also named Best Hitter. Her volleyball playing matured rapidly and Torres has been instrumental in bringing the Cuban National Team into the top ranks of volleyball teams in the world. Torres’s play at the inaugural World Grand Prix in 1993, where she won a gold medal and was named Best Receiver and MVP, began a spectacular run of international triumphs. She won gold medals at the World Grand Champions Cup in 1993, where she was named Best Receiver, and at the World Championship in 1994. She won a silver medal at the 1994 World Grand Prix and a gold medal at the 1994 World Championship, where she was named both Best Blocker and MVP of the tournament. Torres also won gold medals at the World Cup in 1995 and at the Olympic Games in 1996. Torres’ medal run continued with a gold medal at World Grand Prix in 1996, followed by a silver medal at 1997 World Grand Champions Cup. She won a gold medal at the 1998 BCV Volley Masters and was named Best Server, and captured the gold medal at 1998 World Championship while being awarded both Best Blocker and MVP of the tournament. After winning, a gold medal at 2000 World Grand Prix, Torres won her third gold medal at the Olympic Games in 2000 and was named Best Spiker. The three Olympic gold medals are a feat only matched by several of her teammates and Karch Kiraly. To top off an impressive run of victories over the past ten years Torres was awarded Best Volleyball Player of the Century by the Federation Internationale de Volleyball (FIVB). She is a well-rounded player and has won awards for many different disciplines in volleyball; serving, receiving, spiking and blocking. She is also an exceptional jumper, and continues to play with the Cuban National Team while she pursues a college education. The Volleyball Hall of Fame is proud to induct Regla Torres Herrera as the greatest volleyball female player of the 20th century.